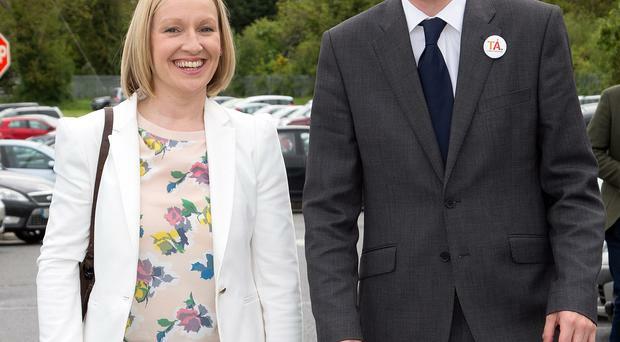 Lucinda Creighton's Renua put a huge dent in Fine Gael's support at the Carlow/Kilkenny by-election. Fianna Fáil will increase attacks on what it calls the Government's failure to protect homeowners and the elderly after taking victory in the Carlow/Kilkenny by-election. There is a growing bullishness in Fine Gael that it can successfully stem its election losses next time. If that is so - and it's a big if - the doubtful looks will be focused upon Labour. Until now, the public has voted based on what was promised during an election cycle. ONLY a handful of results have come out, so here are the top 10 things you need to know from this morning's tallies. MERE mortals don't get to pick and choose where their taxes go to. But Alan Shatter has no compunction about deciding himself how their taxes are spent. Those who cannot remember the past are doomed to repeat it. The saying is often credited to the Spanish-American philosopher George Santayana. RELAXING over coffee in the environs of Leinster House in 2010, former Justice Minister Alan Shatter cast a series of less than flattering verdicts on the men whose shoes he would fill. IRELAND'S 12 MEPs have cost the taxpayer an average of €2m each in generous salaries, expenses and allowances, the Irish Independent can reveal. His party is taking a battering in the opinion polls but a Labour Party local election candidate is hoping to make a splash with the electorate after taking his campaign to the River Shannon. Marian Harkin proffered a leaflet to a man on the street of Ballinasloe, but he shook his head. "I'm not living here – I'm from Ferbane," he explained. Plenty of accusations have been flying around in recent weeks of election posters being stolen or defaced. THE results of the Irish Independent/Millward Brown opinion poll indicate the final seat in each of the three European constituencies is still up for grabs. THE return of the Fianna Fail 'old guard' has prompted a voter backlash against Micheal Martin, an Irish Independent/ Millward Brown opinion poll shows. PUBLIC confidence in An Garda Siochana has been seriously shaken by the wave of controversies and scandals engulfing the force. There is overwhelming public support to give the Public Accounts Committee (PAC) substantially greater powers to investigate and to make adverse findings against individuals. THE Midlands-North-West constituency looks set to produce a nightmare result for Fianna Fail and its leader Micheal Martin. FORGET whistleblowers, Enda Kenny is off on a whistlestop tour. So the dust has settled after the General Election -- or at least it has half settled. We have seen the tsunami against Fianna Fail which has swept Ireland. All that remains now is for next Wednesday and the coming into government of the new combination of Fine Gael and Labour and the stunning and startling range of opposition members who will inhabit the seats in Dail Eireann. Nobody can say with absolute certainty what the people just voted for, although everybody will have an interpretation to fit in with what may best suit them now. Will Enda meet promise to open Nama 'secret society'? 'THE dog's dinner.' That's what the venture capitalists say they've come for when they roll up in their chauffeur-driven Mercedes S Class limousines to Nama headquarters on Grand Canal Street. Last Thursday night, Fine Gael and Labour negotiators could have done worse than attend the National Forum's first meeting after the election. Its debate on what government could best deal with our economic crisis might have been designed as a seminar for them. SO the Irish have had their general election. Patrick has spoken. But I fear he has only exchanged Tweedledum for Tweedledee. The useless Brian Cowen was a solicitor. The new Taoiseach was a teacher. Neither has the scarred knuckles needed to take on the European Central Bank in Frankfurt. EVER got the feeling you've been had? We voted for change but suddenly everything is back where it was before the election campaign began. The attitude from Europe seems to be that they turn a blind eye to politicians saying reckless things during election campaigns, putting it down to the exuberance of electioneering. In the weeks after a General Election, things usually unfold as though written in a script. And the politicians and the media follow it faithfully. Last week, they encouraged us to fret over tiresome details. THIS column is addressed first and foremost to the 76 Fine Gaels TDs who will be taking up their seats in the new Dail next week, especially the new TDs. THE red coupe was heading toward the exit, out through the big gate on to Kildare Street. THERE will be no champagne corks popping if Fine Gael and the Labour Party rise to their own and almost everybody's expectations to reach an agreement. They are famed for their unintelligible speech and mystical jargon. So when a central banker uses words like "alarm" you know it is time to sit up and listen carefully. PICTURES of Enda Kenny and Phil Hogan holding talks with Eamon Gilmore and Joan Burton are reassuringly familiar to anybody who enjoys the traditional foreplay that inevitably leads to the formation of a new Irish government. TRYING to sell a coalition deal to Labour Party members emboldened by record election gains may well be a harder nut to crack than agreeing a programme for government. WELL, "the blinds is down Joxer", certainly for Fianna Fail, and particularly in Dublin. IT was early on Saturday and although Fianna Fail's Martin Mansergh was heading towards electoral oblivion, he still found time to lecture the media. Ever the stickler for semantical accuracy, Martin said on RTE Radio 1 that he "would caution" journalists not to be using words like "wipeout" in regard to Fianna Fail. WHATEVER about the public, very few party members would recognise the man credited with winning the election for Fine Gael. LATE last year Eamon O Cuiv said he believed some people wanted to "rid" Ireland of the Catholic Church, the GAA and Fianna Fail.